Are you a designer in need of Continuing Education Credits? We're hosting Lutron seminars next week in all 3 of our showrooms. You can fill out this form to RSVP, or send an email to me (cschla@dominionelectric.com) or Greg Tiedemann (gtiede@dominionelectric.com). We hope to see you! 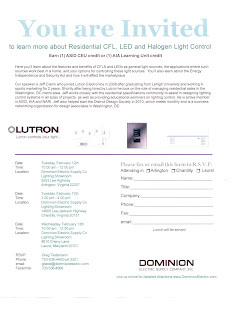 to learn more about Residential CFL, LED, and Halogen Light Control. Earn (1) ASID CEU credit or (1) AIA Learning Unit credit. Here you'll learn about the features and benefits of CFLs and LEDs as general light sources, the applications where such sources work best in a home, and your options for controlling these light sources. You'll also learn about the Energy Independence and Security Act and how it will affect the marketplace. Our speaker is Jeff Cianni who joined Lutron Electronics in 2008 after graduating from Lehigh University and working in sports marketing for 2 years. Shortly after being hired by Lutron he took on the role of managing residential sales in the Washington, DC metro area. Jeff works closely with the residential specifications community to assist in designing lighting control systems in all sizes of projects, as well as providing educational seminars on lighting control. He is an active member of ASID, ALA, and NARI. Jeff also helped start the District Design Society in 2010, which meets monthly and is a business networking organization for design associates in Washington, DC. Lunch & refreshments will be served.